FPGAs are wonderful things, packed with logic cells that can be reconfigured as your heart desires. They excel at signal processing, anything requiring speed, and recreating vintage hardware. In that vein, [Jon Thomasson] decided to bring back the original Nintendo Entertainment System, in perfboard form. The build uses a Spartan 6 from Xilinx, which [Jon] uses in the form of his own development board design. The NES core is courtesy of code by [Brian Bennett], sourced from Github. Games are loaded from an SD card by a Parallax Propeller, which passes the data to the FPGA over a serial connection. Display is on a sharp 800×480 LCD, with the 4:3 video output of the NES being displayed in a pillarboxed fashion. The project is assembled on perfboard, with a pleasing handheld formfactor. Control is via tactile pushbuttons in the classic NES layout. Current draw is approximately 400 mA, giving a runtime of around 5 hours when running off four AA batteries. We’ve seen the venerable NES implemented on FPGA platforms before. As development boards get cheaper and devices get more capable, expect to see ever more complex systems being implemented. Video after the break. Of all the retro systems, the Commodore 64 had the best video system. The VIC-II chip in the C64 was the best example of why Commodore was the best, but in terms of video output, the C64 was still a consumer device: the only output was S-video, or composite video, or something like it. The professional stuff uses YPbPr, an RGB video signal that separates the red, green, and blue colors. On a modern LCD, the difference between composite and YPbPr is noticeable, and if you’re going to run your C64 on the big screen, it would be very helpful to use a professional video standard. In an effort to bring the C64 into the future, [c0pperdragon] created an FPGA-based modification for the VIC-II chip. The end result is getting YPbPr signals directly from the computer, and outputting it to a TV in glorious 480p. Inside the Commodore 64, the VIC-II creates the chrominance signal in a way that is impossible to convert it back to any form of RGB. The solution to get RGB out of this information is to listen in to 22 pins of the VIC-II to determine what signals it intends to generate. This is done with a smallish Altera FPGA connected to the VIC-II through a ribbon cable. 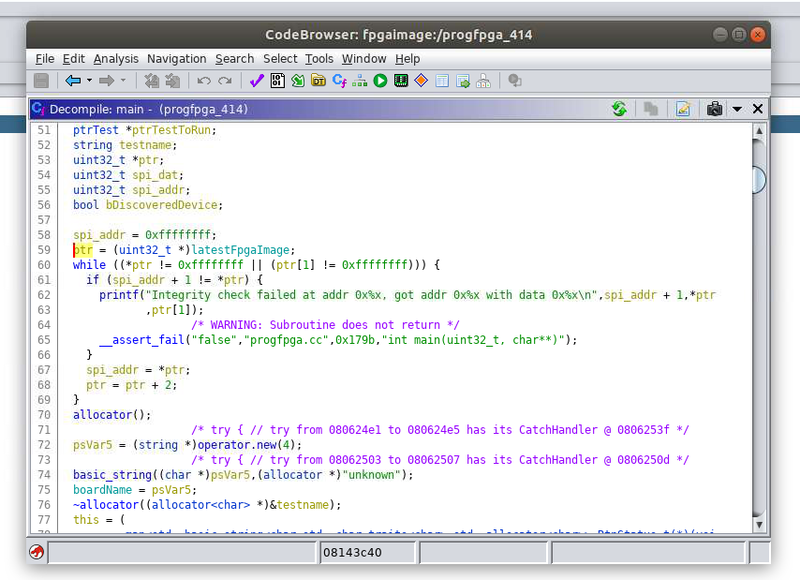 On the FPGA, the luminescence and all the color information is generated, then converted into true YPbPr. For the complete mod, the RF modulator is removed, and the original A/V jack is still functional. This is effectively a very in-depth mod that rids the C64 of the TV connector and channel selector (that no one uses anymore) and replaces it with a professional-grade video output. When it comes to C64 mods, we thought we’ve seen it all. We’ve seen C64s resurrected from the dead, and we’ve seen drop-in replacements for the SID that still don’t have working filters oh my god. This is on another level. This is using FPGAs to drag the C64 into the modern era, and if you don’t care about the rusting RF box, it’s a reversible mod. Hackaday readers are perhaps familiar with the Arduboy, an open source handheld gaming system that aims to combine the ease of Arduino development with the seething nostalgia the Internet has towards the original Nintendo Game Boy. While not quite the same as getting one of your games published for a “real” system, the open source nature of the Arduboy platform allows an individual to develop a game playable on a commercially manufactured device. While the Arduboy hardware itself is actually quite slick, that hasn’t stopped people from trying to bring its games to other pieces of hardware. Now thanks to the efforts of [uXe], the Game Boy Advance is well on its way to becoming Arduboy compatible, in a way bringing the whole project full circle. Assuming this gadget becomes a commercial device (it sounds like that’s still up in the air), Arduboy developers will be able to proudly play their creations on the final and objectively best entry into the Game Boy line. Getting to this point has been something of an adventure, as documented in a thread from the Arduboy forums. Members of the community wondered what it would take to get Arduboy games running on a real Game Boy, but pretty quickly it was decided that the original beige brick model wasn’t quite up to the task. Eventually its far more capable successor the Game Boy Advance became the development target, and different approaches were considered for getting existing games running on the platform. 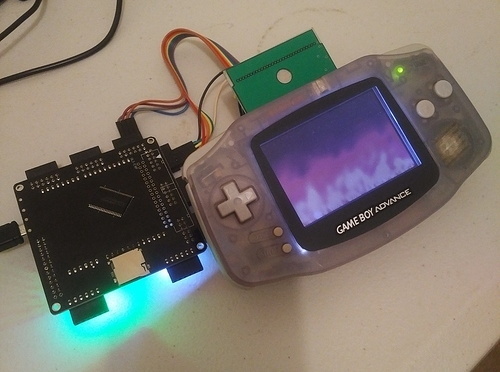 While there were some interesting ideas, such as using the GBA’s link port to “feed” the system games over SPI, in the end [uXe] decided to look into creating an FPGA cartridge that would actually run the Arduboy games. In this scenario, the GBA itself is basically just being used as an interface between the FPGA and the human player. In addition to these low-level hardware considerations, there was considerable discussion about the more practical aspects of bringing the games to the new hardware, such as how to best scale the Arduboy’s 128 x 64 output to the GBA’s 240 × 160 screen. As demonstrated in the videos after the break, [uXe] now as all the elements for playing Arduboy games on the GBA in place, including the ability to disable full screen scaling by using the shoulder buttons. Now he just needs to shrink the hardware down to the point it will fit inside of a standard GBA cartridge. Beyond that, who knows? Perhaps the appeal of being able to run Arduboy games on a real Game Boy is enough to warrant turning this hack into a new commercial product. Thanks to a hardware swap we’ve seen Arduboy games played on the Dreamcast VMU, and [uXe] himself previously grafted Arduboy-compatible hardware into an original Game Boy, but being able to play these games on an unmodified Game Boy Advance obviously has its own appeal. At the very least, it will be a bit more ergonomic than using a hacked classroom gadget. When you think of analog computing, it’s possible you don’t typically think of FPGAs. Sure, a few FPGAs will have specialized analog blocks, but usually they are digital devices. [Bruce Land] — a name well-known to Hackaday — has a post about building a digital differential analyzer using an FPGA and it is essentially an analog computer simulated on the digital fabric of an FPGA. Whereas traditional analog computers use operational amplifiers to do mathematical integration, on the FPGA [Land] uses digital summers The devices simulate a system of differential equations, which can be nonlinear.